The American Association of State Highway and Transportation Officials recently made appointments to two of its committees. 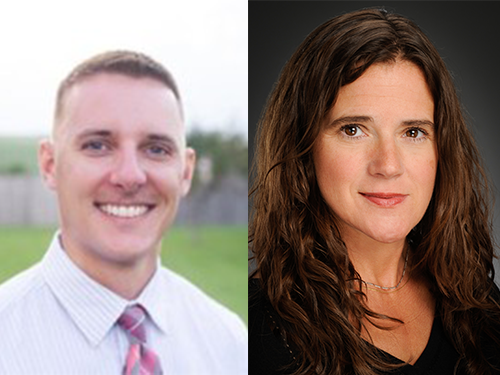 Carmen Swanwick (above at right) from the Utah Department of Transportation will chair AASHTO’s Committee on Bridges & Structures, while Devin Townsend (above at left) with the Nebraska Department of Transportation will serve as a member of the Special Committee on AASHTOWare. Carmen Swanwick, currently Utah DOT’s Region 2 Deputy Director, previously served as the agency’s chief structural engineer for nearly a decade and sports over 15 years of experience as a consultant in structural engineering within the transportation industry and has both a Bachelor’s and Master’s degree from the University of Utah in civil/structural engineering. Swanwick also participates in numerous National Cooperative Highway Research Program or NCHRP projects and serves on several Transportation Research Board committees. She’s has been involved in various Utah DOT initiatives over the years, including the agency’s Accelerated Bridge Construction or ABC program, development of its unmanned aerial systems or drone program, and Model Based Design and Construction or MBDC effort with an emphasis on Building Information Modeling or BIM for bridges and structures. Swanwick explained in a phone interview with the AASHTO Journal that there are three areas she would like to focus on during her tenure as the Bridge & Structures committee chair: the asset management part of bridges, maintaining them in a good state of repair, and collecting the right data for making better decisions. “With all the new data being made available to us, we can make more informed decisions and get structures to last longer,” she said. “Technology is advancing quickly and we have better materials available to us today. So we need to use them to help us deliver projects faster, not 10 years from now. Also, the new types of materials are so much more durable, too – they should make bridges last longer as well. Meanwhile, Devin Townsend – who took on the role of chief technology officer for the Nebraska DOT just last December – got appointed to an initial two-year term as a member of the Special Committee on AASHTOWare, known as SCOA, with his term beginning immediately and wrapping up on June 30, 2020. Townsend, who has been with the Nebraska DOT for nearly 11 years, credits a “unique background” that spans experience in civil design and construction as well as information technology for a “customer-focused perspective” on how technology can impact state DOT operations.